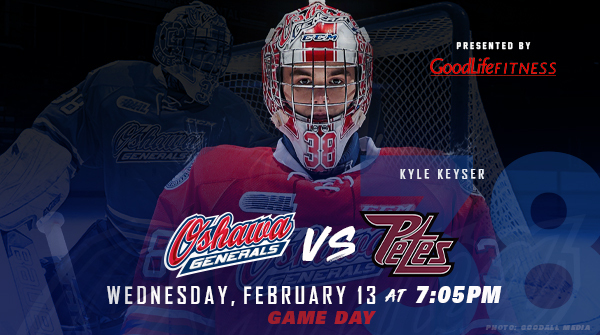 GAME PREVIEW: GENS VS. PETES TONIGHT AT HOME AT 7:05PM FOR RIVALRY NIGHT! The Generals take to home ice tonight for a tilt against the Peterborough Petes for Rivalry Night! 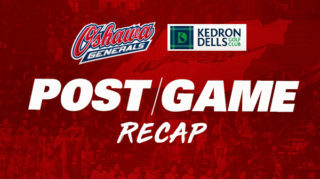 After extending their winning streak to three straight games with a 4-1 win over the Barrie Colts on Sunday, the Gens head into the contest with a 33-18-3-0 record on the season. 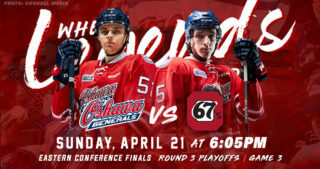 Looking to make it four victories in a row, the Gens will aim to take down the rival Petes in Oshawa tonight. Tonight’s game marks the eighth time the Gens will square off against Peterborough this season. Oshawa has had success against the rival team so far, claiming a 5-1-1-0 record in their season series with the Petes. 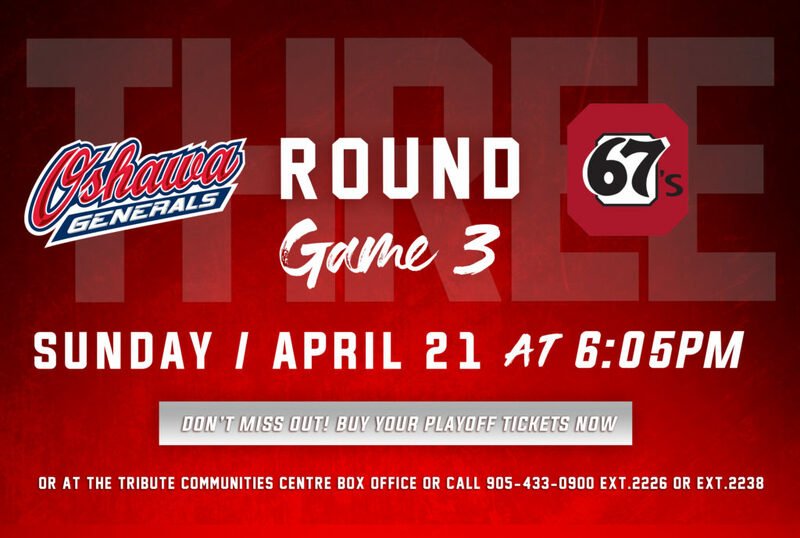 In the final game of the series between the two teams, the Gens will look to finish it off by continuing to dominate the Petes when the divisional team rolls into town tonight. 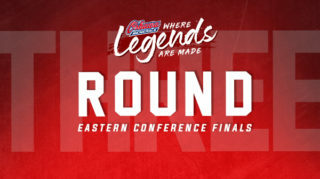 Recording at least one point in their last six games, the Gens sit at 69 points in 54 games on the season, keeping a hold on second place in their division behind the 67’s and fourth place in the conference. Meanwhile, the Peterborough Petes can be found in the middle of the pack in the eastern conference, sitting in sixth place with a 25-24-1-2 record. With Oshawa continuing to pick up points down the stretch, the Gens will look to increase the gap between them and the Petes with a two-point performance tonight. A couple of Gens players entering the game on hot streaks include forward Brandon Saigeon and defenseman Nicolas Mattinen. Saigeon is coming into tonight’s contest on a 7-game point streak, tallying 13 points over that stretch. 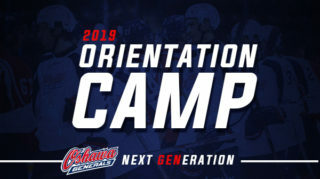 After recording 2 goals in the team’s big win over the Colts on Sunday, look for Saigeon to continue his streak and help drive Oshawa’s offense. Mattinen has also been tearing it up from the blue line, riding a 7-game point streak of his own. Notching 12 points during that period, the defenseman has been a force from the back end and should be watched to continue his strong play in tonight’s game. 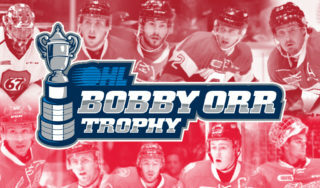 Come join us at the Tribute Communities Centre tonight for Rivalry Night at 7:05pm to watch the Gens face off against the Peterborough Petes! After tonight, the team will head on the road to the States to play the Firebirds and Spirit before returning home to battle Sudbury on Family Day!